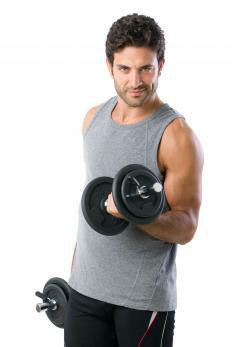 Dumbbell curls are weight training exercises that target the biceps brachii. The use of dumbbells makes this exercise highly adaptable, enabling athletes to work the two heads of the biceps from a variety of angles. Additionally, dumbbells carry a lower risk of injury than barbells, making this exercise a good choice for weight training novices, or for those undergoing rehabilitative therapy. As a result, dumbbell curls are among the most popular for adding size, strength, and endurance to the biceps. Most dumbbell curls can be performed either seated or standing. Beginning with the dumbbells resting at each side and the wrists in a neutral position, the athlete takes a breath and begins to rotate the wrist while curling the dumbbell upward. When the elbow joint reaches 90°, the dumbbell should be parallel to the floor. The athlete exhales forcefully during the last third of the movement, performing a brief isometric contraction as the elbow is fully flexed and the dumbbell is at its highest point. The weight is then lowered to the starting position in a slow and controlled manner. Dumbbell curls are an excellent choice to stimulate the full range of muscle fibers in the biceps brachii, as well as the brachioradialis and brachialis, which act as synergists during the movement. The rotation of the wrists brings the biceps through a complete range of motion, including protraction, flexion, and supination. To target more specific regions of the biceps and stabilizer muscles, a number of variations on standard dumbbell curls are possible. Incline dumbbell curls are performed in the same manner as the standard movement, but with the back resting against an incline bench set at about 45°. The beginning position of the exercise has the elbow fully extended and the biceps slightly stretched, allowing for a greater range of motion during the exercise. The change in angle also tends to focus a greater degree of stress on the lower fibers of the muscle, which can improve the definition of the biceps peak. Concentration curls focus stimulation specifically on the biceps brachii itself. Normally performed one handed, the concentration curl begins by sitting with one elbow braced against the inner thigh and the dumbbell in line with the leg. The athlete then curls the dumbbell with no wrist flexion or other movement, exhaling at the top of the movement. This is also a good exercise to reduce any swinging or leaning that might unintentionally remove the focus from the biceps. Hammer curls are another variation of dumbbell curls that modify the primary agonist of the exercise. While there is still stress to the biceps brachii, this exercise is best known for targeting the brachioradialis, the prominent forearm muscle that runs from the lower, outer humerus to the middle of the radius. Hammer curls are performed seated or standing, and begin in the same manner as a standard dumbbell curl. The difference lies in the lack of wrist rotation during the course of the movement. Keeping the wrist neutral, the dumbbell is raised and lowered by moving only the elbow joint. During all dumbbell curls, any excessive swinging or leaning to assist with the lift should usually be taken as a sign that too much weight is being lifted. This can lead to muscle and tendon tears, or other injuries that may require lengthy recovery periods. To prevent injury and maximize gains, an appropriate weight should be used for these, and all, weight training exercises. What are the Different Types of Bicep and Tricep Workouts? What is the Biceps Femoris? What are the Different Types of Dumbbell Chest Exercises? What is an Incline Dumbbell Press?